THE TWENTIETH PART OF A DOLLAR. 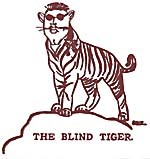 After being a spectator to the amazing antics of ye Blind Tiger and his cohorts in and about the vicinity of ye Maroon office we are now convinced that his mother drowned the wrong one! Well, the little blue covered wolumn is out. I suppose the Phoenix must be published but it seems n' awful waste of time when the Whistle (Adv.) is running. Which reminds me that the booful blonde lady at the desk said the best way to get to the third floor of Cobb Hall was to get a Phoenix salesman on your trail. THEN RUN. Moved his ears and had a tail. What does the poor amoeba do? There are no strings to tie him to. An atom and a molecule. Grand Exalted Thrower - Bobby Mac. Executioner 5th Class -- The Blind Striped Feline. Password (secret) -- Allay-ooooop! 1234.